Kansas State, Eric Gallon 13-47. Nebraska, Brown 28-145, McCant 13-100, Lance Lewis 6-79, Calvin Jones 6-46. Kansas State, Smith 10-172, Gallon 6-82, Frank Hernandez 4-30, Russ Campbell 3-34. Nebraska, Jon Bostick 3-46, Johnny Mitchell 2-45, Tyrone Hughes 1-9, Derek Brown 2-7.. Missed field goals: Kansas State, Wright 32. Nebraska, none. Kansas State, Masters 1-2. Nebraska, none. Kansas State, William Price 7-5-12, Joe Boone 3-4-7, Chris Patterson 3-3-6. Nebraska, Tyrone Legette 7-5-12, Steve Carmer 6-5-11, Travis Hill 6-5-11. Kansas State, Ekwensi Griffith 1, Patterson 1. Nebraska, Trev Alberts 2, Hill 2, Pat Engelbert 1, Jamie Liewer l, John Parrella 1, David White 1. The largest crowd ever to see the end of a Nebraska-Kansas State football game (virtually all of the 76,209 announced) held its collective breath. Underdog Kansas State had just driven 62 yards to a first down at the Nebraska 11-yard-line with less than a minute to go. The Wildcats had led most of the game against the ninth-rated (AP) Huskers, but two fourth-quarter touchdowns by NU's Derek Brown had rallied the home team to a 38-31 lead. Now, K-State faced fourth-down-and-6 at the Husker 7. Only 40 seconds remained. Nebraska's Ed Stewart and Jamie Liewer forced Wildcat quarterback Paul Watson out of the pocket. Watson had already thrown for 340 yards in the game, and now he found tight end Russ Campbell open in the right flat, near the goal line. Campbell got both hands on the ball. But Nebraska linebacker Travis Hill had a hand on the ball, too, and ripped it away. Nebraska had beaten Kansas State for the 23rd-straight year. But this victory had been decidedly tougher than nearly all of the preceding 22 in the string. "You can forget the history of any of these games in the Big Eight," said Husker defensive coordinator Charlie McBride. "What we did was great. "We pulled out every ounce we had left in the tank. That's real football. You haven't seen many of these type of games around here." Kansas State gave an indication that things were going be different on its first series. Starting at their 24-yard-line, the Wildcats scored in 12 plays, taking a 7-0 lead on Watson's 7-yard TD pass to Michael Smith. Nebraska bounced back to take a 14-7 lead by the end of the quarter on a 1-yard run by Brown and 32-yard run by quarterback Keithen McCant, and things seemed to be back to normal. But K-State got a field goal and another Watson-to-Smith TD pass in the second quarter for a 17-14 lead, and the Huskers weren't to lead again until Brown's third TD of the day with 2:47 left in the game. After a 17-17 halftime tie, K-State went up 24-17 with 9:15 left in the third quarter, when safety C.J. 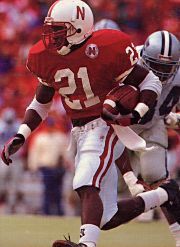 Masters ripped the ball away from Husker fullback Lance Lewis and ran 40 yards to score. Minutes later, NU tied it at 24 on a 4-yard pass from McCant to tight end Johnny Mitchell, but the Wildcats regained the lead, 31-24, on a 3-yard run by Watson with 2:42 left in the third quarter, capping an eight-play, 79-yard drive and setting up all the fourth-quarter dramatics. the sellout was Nebraska's 179th in a row at home. Quote of the game: "I got a hand on it first. He got two hands on it, and I just pulled it out. Whew! I don't like them that close." - Nebraska linebacker Travis Hill.